Tony Ulwick has spent a quarter-century pioneering the Jobs-to-be-Done method for product design. The founder of innovation consulting firm Strategyn, he’s helped hundreds of companies create new goods and services using JTBD principles, as well as his Outcome-Driven Innovation process. The latter is chronicled in Tony’s best-selling book What Customers Want. I caught up with Tony to get his take on why the popular Silicon Valley innovation strategy of “pivot and fail fast” is flawed, and how to identify and map the Job-to-be-Done. From surgical tools and circular saws to building playlists and circumventing highway traffic, Tony’s multidisciplinary anecdotes illustrate the wide ranging application of this philosophy. What follows is a lightly edited transcript of our conversation. Short on time? Here are nine quick takeaways from our chat. The problem with the pivot and fail fast approach to innovation – it guesses at what unmet needs might exist without ever defining them. Einstein said, “If I had an hour to solve a problem, I’d spend 55 minutes thinking about the problem and 5 minutes thinking about solutions.” This is how Outcome-Driven Innovation works. The hard part is identifying and prioritizing unmet needs. To create a better product, you have to measure how well the current iteration does the job from three angles: the functional perspective, financial perspective, and consumption chain perspective. Getting a job done better means doing it faster, more predictably, and with higher output. That criteria is universal across jobs and should guide research questions. JTBD research should focus on actual users. They – not prospective users – have the experience to know what’s important and satisfying when getting the job done. A product might satisfy an emotional job at the point of purchase (e.g. a luxury vehicle), but it will be judged on getting the job done from that point afterward. Personas should be built on a foundation of statistical user data, rather than observations. The latter is an imaginary target, while the former segments around unmet needs. Market segmentation is critical, because people can struggle to get a job done in a myriad of ways. Before committing to a new product, revisit your marketing strategy. Your product may already do the job, but lacks messaging built around this idea. Des Traynor: You said a while ago that pivoting and failing fast are not great techniques for producing innovation. We’re here in San Francisco, the land of pivoting, the land of failing fast. What’s wrong with this approach? Tony Ulwick: It’s associated with failure, unfortunately. When you think about innovation, what you’re trying to do is to come up with solutions that address unmet needs. The way I go about this is more like trying to solve an equation, and like any good equation there are constants and variables. Des: Like a brute force approach? Tony: It is. It’s a guess, right? In any given market there might be 100 needs and 15 might be unmet. You’re just hoping to come up with a solution that addresses those 15 unmet needs. The chances of you randomly doing that are pretty slim. That’s why you have to pivot and fail fast and iterate and get there slowly, and most companies just don’t get there. It’s a time-consuming, wasteful approach that is unnecessary. Our thought is, “Why should you fail at all?” The goal should be to know what those 15 unmet needs are upfront and then spend your time trying to come up with solutions that address them. What are the chances of you randomly coming up with a solution that addresses those 15 unmet needs, if you don’t know what they are? They’re not good, but flip it around. What are the chances of you solving and satisfying 15 unmet needs if you know exactly what they are? That’s really the essence of what Outcome-Driven Innovation is all about. Des: The pivot and fail fast folks would argue that they do this because they have yet to find a method that presents these unmet needs on a silver platter. You know what they often say; a problem well stated is a problem half solved. Is it the type of situation where if you have research to understand the unmet needs then the solution becomes obvious? Tony: It is. Einstein said, “If I had an hour to solve a problem, I would spend 55 minutes thinking about the problem and 5 minutes thinking about solutions.” This is pretty much the same thing. What we’re really trying to do is to find those unmet needs. What is the problem that the customer is trying to solve? The answer has become pretty apparent, and I’ll give you a good example. 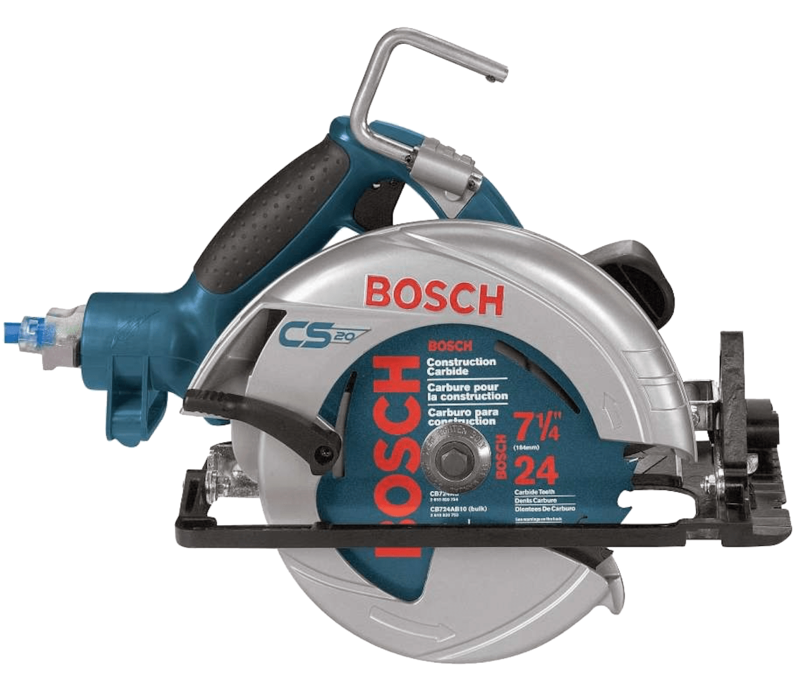 When we worked with Bosch helping them create their CS20 circular saw, we spent two months defining and uncovering the unmet needs in one segment of the market. 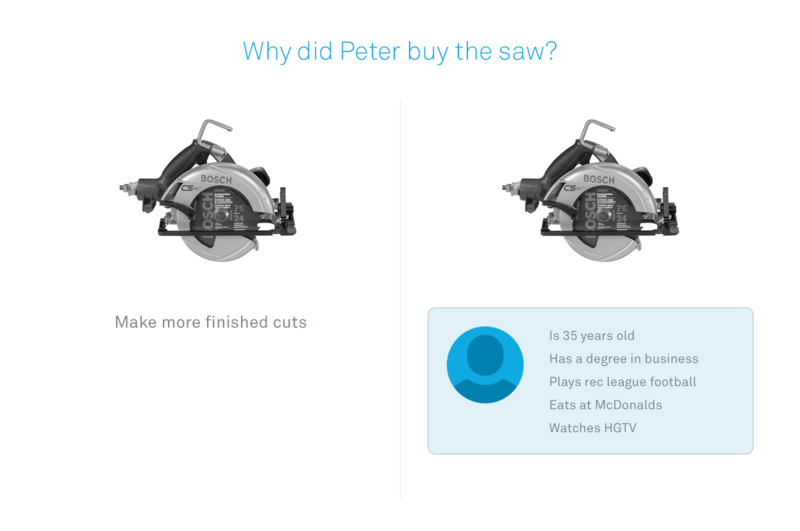 This was interesting because the circular saw has been around for a long time. It’s a commodity type market, and they weren’t sure there were any unmet needs. When we looked at the market as a whole we didn’t see any unmet needs either, so we segmented the market around unmet needs and found a segment of customers that struggled more than others to get the job done. The reason was they had to make more finished cuts. They had to make more blade height changes, they had to make more blade angle changes, and because they had encountered these different variables that caused complexity, they were underserved along a number of different dimensions. We discovered precisely what unmet needs they were struggling with, and we came up with the CS20 circular saw to address those needs. It took us two months to identify those needs and prioritize them, but it took the engineers three hours to come up with the solutions that address them – three hours. Des: One of the sentences there, it sounds almost like a sleight of hand, “We segmented the market around unmet needs.” What does that look like? How do you do that? Tony: This is one of the key governances and advancements in our approach. It starts with the fact that customers do have unmet needs. It makes sense. Marketing 101 suggests that you want to discover segments that have different unmet needs. Now, if you are going to discover segments of customers with different unmet needs, what is it that you should segment around? Attitudes? Behaviors? Demographics? Psychographics? Or unmet needs? It is obvious but it’s not usually done that way. Our take is that if you want to discover segments of unmet needs, then segment around unmet needs. The problem is that in most companies there’s not an agreement on what a need even is, and in most research methods, they don’t describe what a need statement is. It’s the most critical input into the innovation process yet the definition is extremely vague in most situations. I’ve seen ethnographic work done where you get 300 pages of detailed information, but what are the needs in there? What constitutes a needs statement? What are the characteristics of a good need input? What structure, context, and syntax does it have to have? All those questions get ignored in most cases. So if we can’t agree on what a need is then it’s going to be really hard to agree on what the customers’ needs are, which ones are unmet, and what segments of customers exist with different unmet needs. It’s Marketing 101 and it all goes back to, “Why aren’t we doing it this way?” Well, it’s because we can’t agree on what a need is. What we’ve spent two decades trying to answer is that key question. What’s a need? The way we describe it, it’s a desired outcome statement. The way we define that is when people buy products to get jobs done, they use a set of metrics to judge how well they are getting the job done. The metrics used to measure value and success are the customers’ needs. We call those metrics desired outcome statements. They have a very specific set of characteristics; they have a specific structure, format, content, etc. Des: When you say it has a precise structure, are you really saying that they are objective and include no opinion about a customer? Tony: Well, they certainly include no opinion on a solution. One of the key characteristics of an outcome statement is that it is free from a technology reference or any solution or approach, because the goal of innovation is to come up with solutions that address unmet needs. If you’re going to customers to understand their needs and they are offering up solutions or technologies or ideas, then you’re getting the wrong input. We know that sounds simple and most people recognize that, yet more than half of the outcomes or need statements that our clients bring to us from previous research are just embedded with ideas. It’s very hard to work away from the the ideas-first mentality and come up with a perfect needs statement. Des: Say somebody wants to manage projects. Their idea statement will be something like, “I need to minimize the amount of time I spend scheduling things in my calendar.” They embed their ideas about the solution in the statement of their need, right? Tony: That’s exactly right. In that statement you mentioned their calendar. Why does it have to be a calendar? You assumed that part of the solution in your need statement. We would never allow that kind of thing, and that happens all the time. Des: When you’re doing research how do you take that to people who have unmet needs? Do you start with just general satisfaction with the product area? Tony: Before coming up with the unmet needs, we have to come up with needs, and that takes the longest period of time. To do that, we create what we call a job map. For those of you who have done business process work and process improvement, I think you can relate to this because what we literally do is define the Job-to-be-Done as a process. It’s a set of tasks that people go through from the beginning to end to accomplish a goal, and what we do is we break down that job into job steps. For a given job, there might be 15 to 20 different steps, and then within each step there’s a series of metrics people use to measure success in getting that step of the job done. For example, if the job is listening to music, one of those steps might be to organize the music and one of the outcomes might be to minimize the time it takes to organize the songs in the order in which you want to hear them. We’re not referring to records, CDs, iPods, or anything else. It’s agnostic to the technology, and it’s hard to do. It just takes practice. Des: How do you stop yourself from falling onto a very abstract definition of a need and prescribing a solution to something like “Make me more successful”? Tony: Jobs that require products and services to address them are very functional. We like to define the job that people are trying to get done in a functional manner. That’s not to say they don’t have emotional jobs they are trying to get done as well. Sure, if you’re listening to music or throwing a party, you want to be perceived in a certain way by your friends. You want to be perceived as successful and appreciated. There’s a whole series of things that you want, but you’re not designing a product to make someone feel appreciated or to be successful. You can’t. What if I were to say, “Let’s design a product to make somebody feel successful.” There’s a lack of context. There’s no function associated with it. What we’d like to do is define the job around the functional element that you’re trying to accomplish. When we do research we capture emotional jobs that you’re trying to get done while getting that functional job done, but we understand the functional job because we’re trying to execute. If it’s listening to music, we break that down into component parts or steps, and then look at the metrics they use to measure value in getting the job done. That’s one key thing, but there’s more to it than that. When we think about customers – and this is often the first question – people say, “Well, who are our customers? We have lots of customers, so how do you even get started?” It’s true, companies have lots of customers, and they come with different titles, which makes it even more complicated. But in a general nature, rather than customers, let’s look at, what kind of metrics do you need to create a perfect product? Let’s answer that question. We need the metrics that people are going to use to judge the function of value of the product to get the job done – to listen to music. We need to get the financial metrics that people are going to use to decide whether they should buy streaming services or a MP3 player: cost of ownership, cost of replacement, cost of upgrade, etc. They are also going to use a set of what we call consumption chain metrics to judge value. People have to receive their products, set them up, install them, interface with them, maintain them, upgrade them, and replace them. People aren’t buying it so that they can maintain and update it. They’re buying it to get this functional job done, but they do have metrics that they use to judge value around those consumption chain elements as well. If you understand all the metrics people are using to judge the value of your products from a functional perspective, a financial perspective, and a consumption chain perspective, you have all the metrics you need to create a better product. Then the question is, who are you going to get those metrics from? That’s who your customers are. Rather than asking, “Okay, is it the nurses, is it the surgeon, is it the hospital administrator, is it the Operating Room (OR) manager?” It might be all those, but if you are creating a part for a surgeon to use, are you going to go to the nurse to get the functional outcomes? No, you’re going to go to the surgeon to get functional outcomes because they are the ones that know what they’re trying to use product for. Who are you going to for financial metrics? The surgeon? Probably not, because they’re not concerned about the financial elements. They’re concerned about the functional elements, but the OR manager or the buying group would be concerned about minimizing the length of stay or minimizing the cost of tools and things like that. Then, who might be involved in minimizing the time it takes to set up the product or the time to sterilize? Well, that could be the nurse or the biomedical engineers. We apply who’s doing the job after we define the kinds of metrics we need to create a great product. Des: How good are users at explaining what their needs are? Tony: They are good at expressing their needs. To understand the unmet needs across a broad range of the population is something different, but I think the real question that you are asking is, how difficult is it for an individual to express their desired outcome statement? Tony: That’s right, but somewhere along that line, you used that metric to judge value. You probably used 50, 60, or 70 metrics over the years to judge this product versus that product. I’m not going to say they’re subconscious because they really aren’t. It’s just not at the front of your mind. This is why it’s really important to create the job map – to remind you of all the steps you had to go through to get that job done. If the surgeon is preparing the patient, positioning them, and then accessing the place where we have to operate and perform the procedure, there are lots of steps. I like picking on surgeons because they are so process oriented. They’ve gone through the same process so many times, performed the same procedure over and over again, and they know exactly step by step what they are trying to do as they are going through that process. We get at these very specific needs that we’re looking for and what makes it inefficient. That kind of questioning leads to good outcome statements. When we have a complete list of outcome statements from beginning to end in a job, it’s the chronological order of everything they (the surgeons) are considering when they are getting the job done. Des: Those criteria of more predictable, or faster, or more efficient, how localized is that to surgeons? Is that because a surgery has a binary outcome – did we do it successfully or not? Tony: Those three are really valid across any job, whether it’s a software-related job, performing some HR function or creating agile code. It’s the same set of circumstances. When you’re creating agile code, you want to make sure you perform certain steps quickly and reliably so things don’t go wrong and there are no defects in that code. 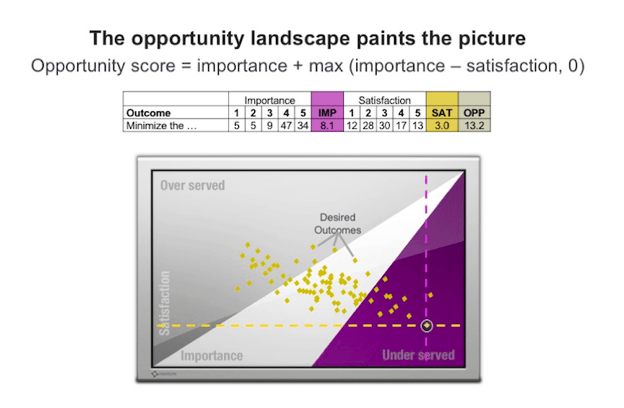 Des: You seem to assign each outcome statement an importance value and a satisfaction value. How do you ascertain that number? Tony: It’s done through statistically valid quantitative research with the customer. It’s not done by our client. We create a survey. It might have 100-150 different outcome statements in it, and we’ve created a way to get all those inputs from customers in a pretty quick period of time. We’ve been using similar techniques for 25 years, so we make it better and better over time. We try to make sure the questionnaires are done in 25-30 minutes, which is fairly lengthy, but we often pay people to take the surveys and have good quality control checks to make sure that people aren’t finishing a 25-minute survey in five minutes. What we’ve discovered is that in most markets, maybe 10 to 15 percent of those taking surveys are fudging their way through the data sets, but they are eliminated so we don’t worry about that. From that good set of data we can figure out which of the needs are important and unsatisfied. I think what you’re referencing is the opportunity algorithm that we created years back. It’s a very simple concept, and it says that a need is unmet if two conditions are met: that need is really important and it’s not well satisfied. Des: I think in most people’s heads, they’ll say, “Well, it must be the difference between satisfaction and importance,” but the calculation is more complex than that. If the job is minimize time to play songs in a certain order, would you survey a lot of potential users or actual users? Des: Would you give them an outcome statement and ask them to rate it? Is that broadly what it is? Des: Let’s say our hypothetical outcome statement says, being able to play something in a certain order quickly has an importance of eight, and a satisfaction of four. The naïve thing to do here is eight minus four, but what you’re saying is that there are two conditions and they’re both represented? It’s really worked well. We’ve studied it a lot more over the years and discovered that it’s about 93 percent accurate. It’s inaccurate in the midpoints, where you have importance and satisfaction about equal to each other, so we’ve tried to create better methods. We’ve never created anything that’s 100 percent accurate. We’ve gone up to 98 percent, but even at that it gets so complicated that it becomes really hard to explain. One of the values of our approach is it’s pretty simply explained. We want to keep it simple but we want to keep it very effective. Des: Are there areas where customers are ill-equipped? 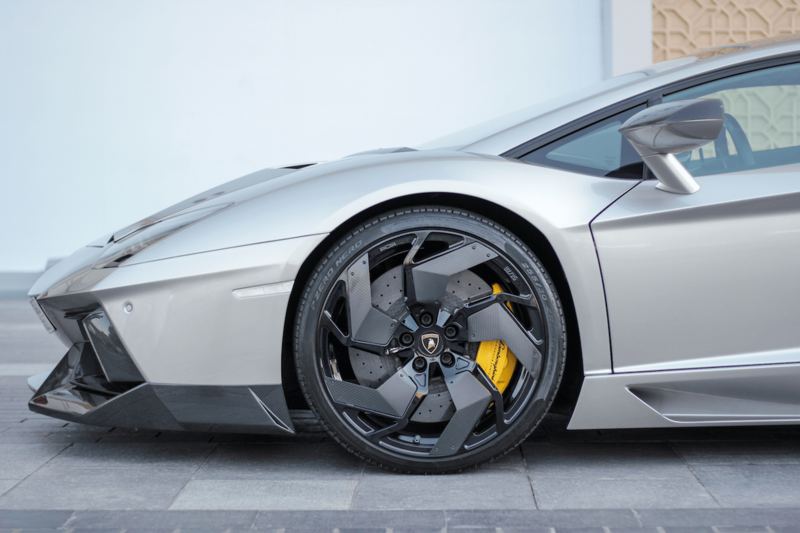 Let’s say in the world of luxury goods, it might be trickier for a customer to actually speak truly about why they are spending so much money on a necklace, a jacket, or a car. Do you think there are irrational purchases, and if there are irrational purchases, as in purchases that don’t make logical functional sense, does this method still work in that area? Tony: That’s a great question. I like thinking of that as two separate jobs. People go through the job of purchasing something. Typically, when you go to purchase something, you start considering the functional metrics, the financial metrics, consumption metrics, and the emotional jobs that you are trying to satisfy. You might make an impulse purchase that isn’t really that wise and people would say that’s an emotional decision, and it very well may be. The emotional decision is coming at the point of purchase. That’s very different than how a customer measures value on getting their job done. Even if they made an emotional purchase, once they bring that product home they are going to go use it to get a job done. Are they satisfied with their ability to get the job done using that product? That’s what we are concerned with, and we study both. We study the purchase process and we study the functional metrics people use when getting the job done – but think about the purchase process as a separate job. Des: Just because people make bad purchasing decisions, that does not therefore mean you should design for and bank on them? Tony: That’s right. That’s a short-term strategy. It might get you a few impulse purchases like the pet rock did. People say that was a fad, and yeah, it was. It satisfied some emotional jobs in the past, but there was no real emotion there. The product doesn’t go on because there’s no real value associated with it. Des: Let’s say all the marketing, all the hype and the amazing sales person got them to make an impulse purchase, and now they’ve bought themselves a car they don’t need. The buyer is still going to evaluate it later based on it being a car, like “Well, this will get me from A to B.” There’s a difference between what feels good to buy and what feels good to use, right? Tony: Exactly, and I think I’ve seen confusion where those lines are blurred. It’s like the argument goes, people make emotional decisions. They might, but that’s in the purchase process. Don’t let that emotional decision affect the way you approach innovation. Des: Take champagne in Las Vegas, for example. They are goods where the purchase is actually your product. The celebration of the purchase is actually more important to the buyer. No one’s taking the ROI of the champagne after they’ve bought it? I’m trying to think of sheer irrational purchases. Sometimes you’ll buy things to be seen purchasing them, and that’s actually what you’re doing it for. Tony: Sure, you see that happen in nightclubs all the time. People are making the wild purchases because they want to be perceived in a certain way. Des: They are probably evaluating it based on that. A bottle of Budweiser will not do the same job as a bottle of Moët & Chandon. Tony: That’s right, but they are trying to get a job done. A lot of times, it might not just be emotional; it can be very functional too. Des: One research technique we haven’t talked about yet is personas – where you create an archetypal user and give them an identity and a scenario in which they encounter your product. The idea is that it will help inform design and product decisions you make. Do you do any of that type of work? Tony: Well, let’s put it in perspective. The question I would ask is, why would you want to create a persona? I think the answer is companies are trying to discover different types of users that might have different unmet needs. If that’s true, then what they are doing is using persona creation as a method for market segmentation. They are going out and observing what appears to them to be different types of users. They’re hypothesizing that because they are different types of users with different demographics and attitudes and so on, they have different unmet needs. This is where it goes wrong, because that’s a bad assumption. Rather than making bad assumptions, what we do is segment the market around the unmet needs, and we can discover segments of customers that struggle more than others to get the job done. I’ll give you a simple example. We did some work for a transportation company and one of the jobs they were focused on was helping business people who have to drive around town to reach their destinations on time. I think we can all relate to this, but some of us go to the same locations every day. We leave at the same time, we know the traffic patterns, we know the backup routes, and we don’t struggle that much to reach our destination on time. But others have to go to different parts of the city, like you did today. You leave at different times, you don’t know the traffic patterns, you don’t know the backup routes, you’re not sure where to park, you don’t know how long it’s going to take from where you park, and because you encounter all these different variables that cause complexity, it’s causing you to be more underserved in getting the job done. This is what we are trying to discover when we segment the market – are there groups of people that struggle more to get the job done? Rather than creating a persona based on observation, we create them based on statistical data. We segment around the unmet needs and then we say, “Okay, who are your three personas?” It’s a group of people who don’t have to travel to a large variety of locations. They know everything about where they are going to go so they don’t struggle, and they don’t have many unmet needs versus another segment on the other extreme that is experiencing that complete opposite. You could call that a persona, but it’s a statistically valid persona that you could target effectively with a product and a marketing campaign versus a traditional persona, which doesn’t do that. Tony: It does make it easier to design when you know the segment that you are designing for, but the problem with a traditional persona is that it’s a phantom target. It’s not a real segment; it’s a madeup segment, which is a misleading concept. That’s why we don’t do that. Doing it through statistically valid data and identifying those kinds of segments like I described, you’re creating a persona, but it really exists. If you go after that segment of people who struggle to reach their destination on time, you’ll know who they are, why they struggle, and what their unmet needs are. In the earlier Bosch example, we discovered a segment of carpenters that were underserved. That’s because they encountered some additional variables that added complexities in getting the job done, which is making more finished cuts. That required them to make more changes in the blade height and angle. Because they have to encounter those different variables and add complexity, they are more underserved, and we find that in all different markets. The importance of that can’t be understated, because if you can find the segment of people that are highly underserved, even in an existing market, you can institute a very effective profit share strategy. Think of Nest for example. How many people are crazy enough to spend seven times more for a thermostat? The answer is about 10 percent of the market, but by controlling that 10 percent of the market, they can control over 30 percent of the profit share in that space, which is great. Apple is the master of this. They have 20 percent market share and 90 percent profit share. That’s unheard of, but it’s the general goal. If there is a segment of people that are highly under-served and willing to pay more, then that makes a really fine target. I’m going to mention one more thing. For about five years we’ve been trying to correlate willingness to pay with unmet needs. It makes sense that it does correlate, but what we were trying to figure out and answer specifically is, which unmet needs will people pay most for? We were always asked this question: here are the 15 unmet needs, will people pay for it? If so, how much, and which of those needs are really driving their willingness to pay? It took us about five years to figure this out, but we’ve been executing that pretty effectively this year and we’re really excited about that. That’s one of the newer additions to the approach. We haven’t written anything on it yet, but I did want to share with you. Des: Back to the example of business people trying to get to the right place in time. Today I’m going somewhere I’ve never been before. Compared to a regular trip, I don’t know the area and I don’t know the neighborhood so I don’t know how long to budget. I don’t know if I could pull up outside or any of those sorts of things. But most days I’m doing a regular trip. That would imply that I have different needs based on different scenarios. Tony: That’s correct; they are different cases. Des: Would part of the research be to talk through case by case? Does the same need exist in all cases? Tony: That’s exactly what we do. As an example, think of a surgical case. When we do work with medical companies on surgery, we ask the surgeon to think about their last case, and then we ask them to describe that case to us: what was the patient type, comorbidities, what situation did they find themself in. Then when we go through and ask them the importance and satisfaction related to that case. What that allows us to do is segment the market around varying cases, if the case itself is causing variability in getting the job done. Des: That makes total sense. If a lot of people said that something’s importance is 1 out of 10 and a lot of people say it’s 10 out of 10, do you end up in a world where you’re describing it as 5 even though that represents no one? This is why segmentation is so critical. Not everyone struggles in the same way to get a job done. If you just assume a market is homogeneous, you’re making a big mistake. Just like in the case with the circular saw. I can give you 1,000 cases, but it’s always the same scenario. That’s why we just ignore the total market. There might be an instance where the total market was purely homogeneous. In other words, after we segmented the market, all the segments are clustered in the same location. Then you could actually do a broad strategy across the entire market and be successful with every customer. We’ve never seen that, but theoretically it’s possible. Des: To go through it from the start, it’s the job map, identifying needs, researching needs, segmenting by case, identifying opportunity and then lastly, designing a solution – and I presume you can use this for marketing as well? Tony: Yeah, there’s really two main uses of the data. One is to create the market sales strategy and the other is to create the product strategy. When we think about the product strategy, we typically go through a protocol that says, “Before you invent anything, let’s exhaust the other possibilities.” One possibility is your product already does the job; you just didn’t message around that. You just need to tell people, and we’ve seen a few situations like that. The first occurrence of that was back in ’94-95 with Cordis Corporation, who was making angioplasty balloons. They had one percent market share. We discovered they were satisfying about five unmet needs better than anybody, and so they revamped their marketing and messaging, armed their salespeople with the right message, and they increased their market share from one to five percent in six months…just by telling people. We have another great story too, a more recent one with Arm & Hammer’s Animal Nutrition Group. We’ve worked with them since late 2013. They revamped their sales and marketing activities in 2014 and generated a 30 percent year-to-year revenue growth, which was fantastic. They did it without changing their product and without changing the pricing. It’s all based on aligning what you’re doing with the needs of customers. In their case it’s dairy nutrition, so they were focused on cow health and cow nutrition, but dairy men are more focused on optimizing their productivity. They go through this very extensive job to do that, and healthy cows is critically important to part of that. Knowing that and knowing how they could contribute to getting the bigger part of the job done helped them generate some additional revenue growth. Des: That’s awesome. I think a lot of our listeners would love to be told that they don’t have to change their product or change their revenue. Tony: We can’t promise that but it’s possible, sure.